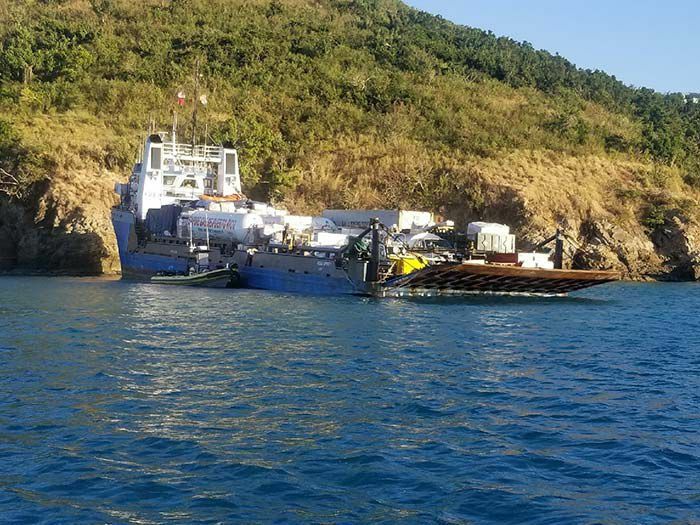 CHARLOTTE AMALIE — A cargo vessel owned by Ferrol Trucking has run aground in the St. Thomas harbor, the Virgin Islands Free Press has learned. No injuries have been reported. The U.S. Coast Guard said its alert station in San Juan was contacted at about 5 a.m. today by St. Thomas Harbor pilots who reported that the Togo-flagged cargo vessel Ocean Spirit I had run aground just off of the entrance of the harbor’s East Gregory Channel. There are no reported signs of distress or oil leaking from the vessel, according to the U.S. Coast Guard, whose marine casualty investigators are on scene investigating the cause of the incident. The East Gregory Channel entrance remains open to maritime traffic. The crew of the Ocean Spirit I checked the depth of the ocean where the vessel’s fuel and ballast tanks were while Sea Tow St. Thomas crews conducted an underwater damage assessment of the vessel’s hull. Coast Guard personnel are working with salvors and the vessel’s master and owner to minimize any potential environmental impact or damage to the vessel’s hull during refloating and removal operations. The Equasis data base categorizes the 1982-built vessel as an offshore/tug supply vessel and shows the registered owner as Ferrol Trucking Services of St. Croix.